Large efficiency studio with double bed, private bath, sleeps 2 adults, parking! RESERVATIONS NOW BEING ACCEPTED FOR SUMMER 2019 starting MAY through October! Ground floor efficiency studio in private 1850's central village home available with microwave kitchenette ( a variety of counter top appliances plus full size refrigerator) in the central village of Rockport only steps from the beach, shops, galleries, restaurants and historic Bearskin Neck and harbor. TRAVELING WITH FRIENDS? Extra sleeping guest rooms (two) with shared bath on top floor available for those wanting extra privacy at additional charge for one or both extra sleeping rooms. We have the best location in town along with the privacy you don't get in a commercial inn or motel, Walk to everything, including the commuter train to visit Boston, Salem, Newburyport or other coastal towns. The studio runs the width of the house with a comfy double bed and reading chair and desk at one end with a peak at the ocean from the window. The central area has a sleeper love seat and TV and an unique mosaic entry harbor scene of Motif #1 in Rockport harbor. The kitchenette end has a microwave, coffee maker, Nuwave hot pate, toaster oven, toaster, electric fry pan, crock pot and all that you need if you choose to cook. You may also use the gas BBQ and enjoy breakfast, lunch or dinner in the garden area with picnic table and chairs. Numerous cafes and restaurants are located within a 2 block walk from coffee shops to elegant ocean front dining. Private yard with lovely gardens for relaxation or BBQ. Air-conditioned! 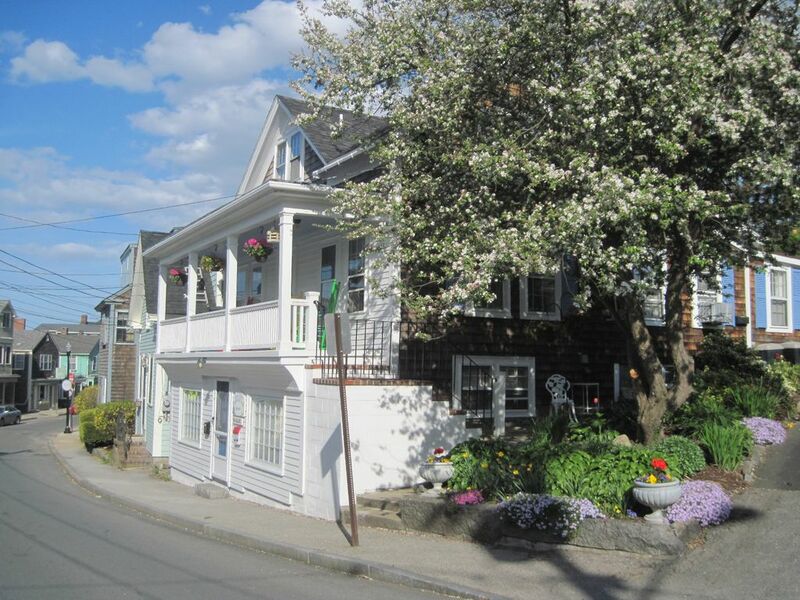 Historic Bearskin Neck shops, galleries and harbor front restaurants just two short blocks away. Visit Halibut Point State park for a picnic or relaxing walk along the coastal paths and explore the tide pools. An artists paradise or relaxing place to enjoy the seashore. WIRELESS ACCESS and CABLE TV. Monthly and seasonal discount available. No smoking or pets. RESERVED OFF-STREET PARKING AVAILABLE FOR ONE CAR!!. Scuba diving at Back Beach, Old Garden Beach or Folly Cove, all popular dive spots! Renting kayaks for solo or guided coastal exploration from Rockport Harbor. Attending live concerts at the Shalin Liu Performance Center a half block away! Visiting neighboring Gloucester for music and night life, theater, harbor and lighthouse tours, historic sights and museums as well as popular whale watch excursions. Enjoy the major city attractions and offerings of Boston: sports, arts, museums, fine dining, cruises, historic tours an easy drive or commuter rail trip away or explore the historic village of Salem and learn about the history of this important seaport or witchcraft. Visit historic sites such as the House of Seven Gables, dine on the harbor front or follow the walking tour path or take the guided trolley tour of Salem. The Peabody-Essex museum exhibits offer enjoyable rainy day or any day adventure. Historic Newburyport is less than an hour away by car (also accessible by train) and offers fine shops, restaurants, music and theatre, historic sights, fishing charters and whale watch cruises. I grew up spending summer vacations in Rockport in a rustic family cottage owned by my grandparents. Now years later I enjoy watching my grandchildren explore the same rocks and tidepools that facinated me as a child. I am a retired science teacher who loves to spend the summer months meeting new people and sharing my love for Rockport with my guests. I love having a unique home in the historic district and especially the extensive gardens which are a constant work in progress with changing color throughout the summer months. I love that the beach is just a few 100 yards away and can be enjoyed on an early morning stroll or afternoon swim. Our property offers the best location in town and the warmth and charm of a private home where you can enjoy the yard, outdoor shower after the beach, reading in the garden glider, people watching from the front second story porch and easy access to all that Cape Ann has to offer. You will enjoy the feeling of privacy that comes with a residential property that larger motels and inns cannot offer. Traveling with friends? We also offer additional guest rooms on the top floor. Two guest rooms are available each with a double bed. The floor is private for your party whether you book one or two rooms. Great option for small family gatherings that afford private sleeping options along with gathering places and outdoor picnic area. Our private yard and garden area offer a peaceful get-away from tourist crowds and a homey place to enjoy a BBQ meal. Outdoor enclosed shower (toiletries & towels provided) for after the beach or a jog combines refreshment and the fragrance of the roses! Enjoy your morning coffee or evening cocktail in our rocking chairs on the front second story porch overlooking the village area with a peak at the ocean.. Flexible scheduling to meet your needs. Perfect location with easy access to beach and shops with the privacy of a home. No cleaning fee or hidden charges. Just please leave spaces neat and tidy.. NO PARKING HASSLES! Dedicated off-street parking space for one car is provided just two houses away. Come and go as you please without parking problems! Upstairs additional guest rooms use on-street parking. Relax in either the shady upper terrace garden area or enjoy the sunshine in the back yard conducive to reading, painting or visiting with friends and famiiy. Front Beach is steps away just around the corner, Back beach is another block and Old Garden Beach is within walking distance. Enjoy hikes along the shore or kayak around the harbor or Sandy Bay. Bike and kayak rentals nearby or bring your own. Enjoy a whale watch, walk to 3 beaches, explore historic Rockport harbor shops. A slice of the ocean is visible from your window as you look between the ocean front buildings toward the beach 2 houses away. Just steps away, take your morning coffee to the beach & enjoy the waves. Rentals available at Northshore Kayak on Bearskin Neck a short walk away. I grew up in Rockport so I knew what kind of setting, charm and location I was seeking. This street level studio delivered. Perfect for 2 people. Stocked with coffee and full size refrigerator and cookware. Hosts were gracious. Beach chairs for guests to use. Parking spot (big bonus in downtown). Loved it. Awesome location. Right across from beach with PARKING. Walk to shops and dinner. Clean, cute and priced right! The studio was nicely located near the restaurants , boutiques and waterfront. It has all of the amenities that one would need for either a short or long term stay. The hostess is a very pleasant and a accommodating person. She is very attentive in ensuring that your stay in Rockport is a good experience and will go out of her way to assist in whatever she can do. We had a wonderful and relaxing stay, however we found that the bed was a little small for a couple. We enjoyed 5 nights in Rockport. This is a perfect location and Wendy is a wonderful host. The studio has many amenities, more than enough blankets, pillows, linens, kitchen supplies and small appliances on hand. Having our own kitchen was wonderful and Wendy's garden is very welcoming. We had a lovely stay. We had a wonderful stay, very nice location near the beach and other attractions and restaurants of Rockport. Very nice backyard with beautiful flowers and a perfect BBQ / resting area. The owners are very kind and thoughtful, always there to meet your needs. Seaside Gardens- We had a wonderful time! This accommodation was one of the best we have ever stayed at. The owner, Wendy, is thoughtful and helpful. Every aspect has been well attended to, every detail was considered and the two night stay we had was only marred by the fact that we actually had to leave to go home... My mother, 85 years young, had no trouble navigating the property and strongly endorses the studio as a comfortable and very lovely place to stay. The gardens are bright and cheerful, (as a photographer I took loads of photos, and will have memories of Wendy's Seaside Gardens for years to come) I do hope we can return again next year. I must add that the bed was very comfortable, the kitchen was well-equipped for every need, and the wifi was excellent. The Air conditioner kept us cool and comfy. Thank you Wendy, we really enjoyed our get-away. Steps to town and beach-perfect! p.s. Wendy gave mom many craft and decorating ideas- the studio is very nicely and creatively decorated with Wendy's special touch:-) Thank you, Deb and Sophie, August 2012. Historic coastal harbor town home to many artisans with fine galleries, shops, antiques, seafood, water activities, Shalin Liu Performance Center (music, Windover (performing arts), North Shore Music Theatre and lots of New England charm. The sights and activities of Boston and historic Salem are close by car or train or you may drive North for a day trip to Newburyport, New Hampshire ports and mountains and Maine coastal communities and outlet centers. Boat and air shuttles to Cape Cod, Provincetown, Nantucket and Martha's Vineyard are available from either Gloucester (next town), Salem or Boston. Other Activities: Whale watching, artist demonstrations, music concerts, deep sea fishing, exploring tide pools, scuba and snorkeling, kayaking, shopping and all kinds of dining options from Helmet's strudel croissants and coffee harbor side to elegant oceanfront dining at Emerson Inn or My Place by the Sea. The Rockport Art Association offers classes for adults and children, sponsors artist demonstrations and hosts gallery exhibitions for a wide variety of artists. Kayak and bike rentals available on Bearskin Neck a brief walk away. Whale watching available from Gloucester (next town) from a number of providers. Enjoy summer events such as weekly Sunday evening free band concerts at Back Beach, the 4th of July parades in Rockport and Gloucester and fireworks. Visit Hammond Castle, enjoy the weekly farmer's market and the old fashioned Little Arts Cinema. Artist demonstrations and visiting authors seminars occur throughout the summer. Painting classes, hiking trails along the coast and Halibut Point State Park or through colonial Dogtown ruins are popular leisure activities. A day is Salem is a must where you can take a narrated trolley tour of the area as well as visiting a number of museums and attractions focused on Salem's maritime history and the period of witch trials. Visit the Peabody Essex Museum, Pickering Wharf, Hemingway's House of Seven Gables, the Witch House among many others. Access by car or commuter train. A lovely coastal drive from Rockport to Newburyport along Route 133 and 1A takes you through coastal towns known for antique shops and restaurants. Visit Tendercrop Farms organic market and flower farm store for the freshest meats dried and fresh flowers and delicious organic meats, freshly baked breads and pies and delicious appetizer snacks. Stop at the Crane Mansion in Ipswich by Crane's Beach (Nesting site for endangered Piping plovers) or take a picnic and enjoy weekly music on the rolling lawn at the Crane Estate. Traveing further north on 95 a day trip to Kennebunkport, ME or Old Orchard Beach or a tour through the White Mountain is all available. Rockport has been featured in numerous movies such as The Promise, The Perfect Storm, The Love Letter just to name a few. Golf: A number of private and public golf courses are in the area within a half hour drive. If extra top floor guest rooms are included, the added cost per room is $75/night.